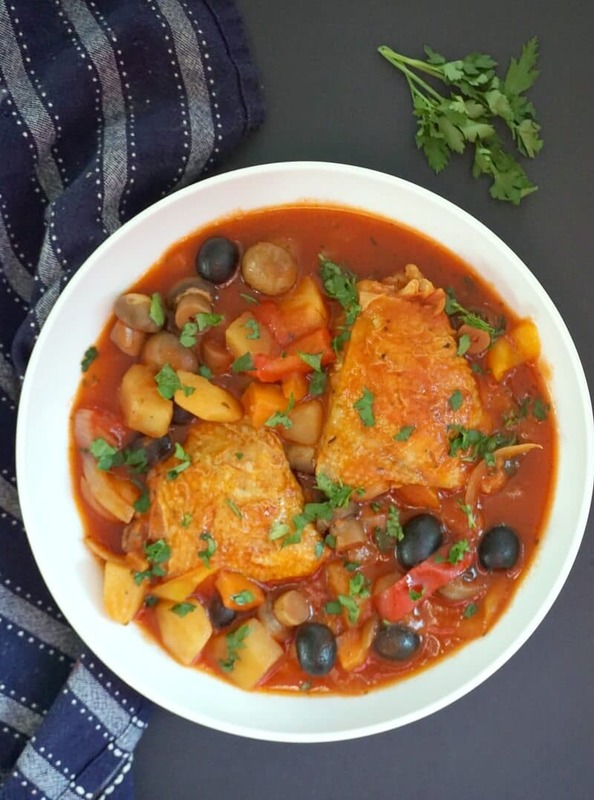 Healthy Slow Cooker Chicken Cacciatore, a fabulous Italian chicken thigh stew with lots of nutritious vegetables. Packed with amazing flavours, and so comforting, this chicken cacciatore is a great family dinner no matter the season. I must have said again and again, but I can’t stop saying how happy I am with my slow cooker. It’s worth every single pence, and mind you, it wasn’t even that expensive. Definitely, this has been one of my best investments in ages. I highly recommend one. Even a basic one like mine does such a brilliant job. I am forever pressed by time. My weekdays are truly hectic. The day starts ridiculously early, since little monkey number too thinks 5 am is a decent time to wake up. Then, the race against time begings. Breakfast, dropping my older daughter in nursery, going to playgroups with little one, then come home for lunch. 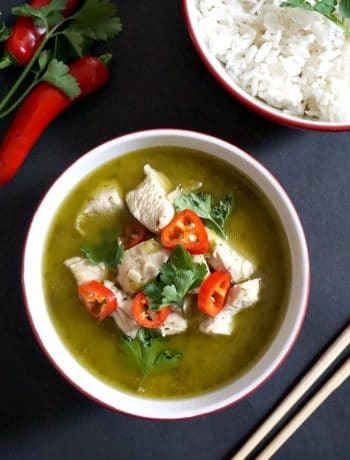 Well, rather than panicking that there is no cooked food, how about coming home to a hot meal already? And that’s only possible because of the amazing crock pot. It makes life so easy, we can have lunch, and there are usually plenty of leftovers for dinner too, so I don’t need to panic again about dinner. 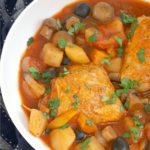 The chicken cacciatore is comforting Italian dish made of chicken (either thighs, breast, drumsticks or whole chicken cut up into pieces), vegetables: mushrooms, peppers, potatoes, onions and garlic, plus olives, and cooked in a delicious tomato and herb sauce. The bone-in chicken thighs work perfectly here, as they bring so much more flavour, and they are cooked until tender and falling off the bone. The tomato sauce is deep and the herbs give that extra kick to make you lick your fingers clean. Since I added potatoes, there was no need for a side dish, but if you don’t use potatoes, you can serve it with mashed potatoes, pasta or rice. Browing the chicken beforehand is not a must, but it definitely adds a richer flavour. I don’t usually brown the chicken breast, but with the thighs I think it tastes tons better. 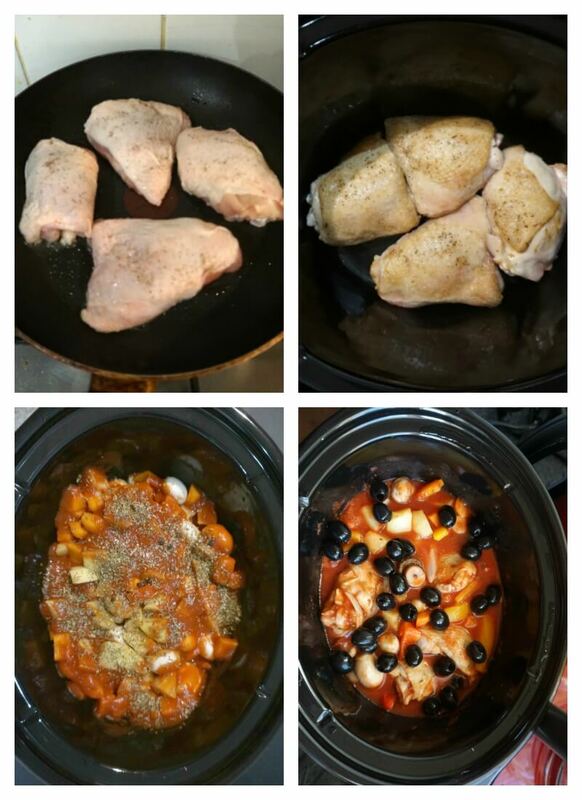 How to cook cook chicken cacciatore in a slow cooker? First, season the chicken thighs, then lightly brown in a pan with a dash of oil. The chicken is NOT cooked at this stage. 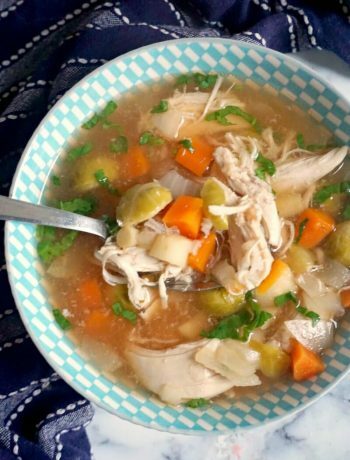 Place the chicken thighs in the slow cooker, then add the mushrooms, cubed potatoes, carrots, peppers, onion, garlic, tomato sauce, herbs and chicken stock. You can either add the olives now or later, it does not makes much of a difference. And I usually season with salt and pepper once the dish is cooked. Otherwise, it’s easy to get tricked and use a lot more salt, while with the final product you can season it to taste. Note that the chicken cooks a lot faster than the veggies, especially the carrots, they take the longest to become tender. How long do I cook the chicken cacciatore in the slow cooker? I cooked this chicken cacciatore for 4 hours on high, and I think on slow it would cook in about 7-8 hours. There is no need to add any more chicken stock, there will be plenty of sauce left once it’s cooked, as the veggies release liquid as well. I absolutely loved this super easy chicken cacciatore, a superb dinner any time of the year. And if you are looking for a traditional chicken stew cooked on the hob, how about my One-Pot Chicken Stew with Mushrooms? 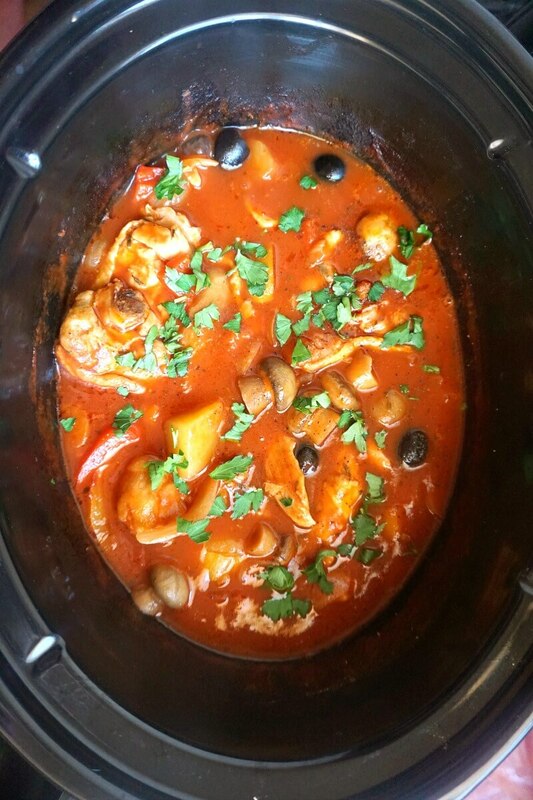 If you’ve tried my SLOW COOKER CHICKEN CACCIATORE or any other recipe on the blog then don’t forget to rate the recipe and let me know how you got on in the comments below, I love hearing from you! You can also FOLLOW ME on FACEBOOK, and PINTEREST to see more delicious food and what I’m getting up to. 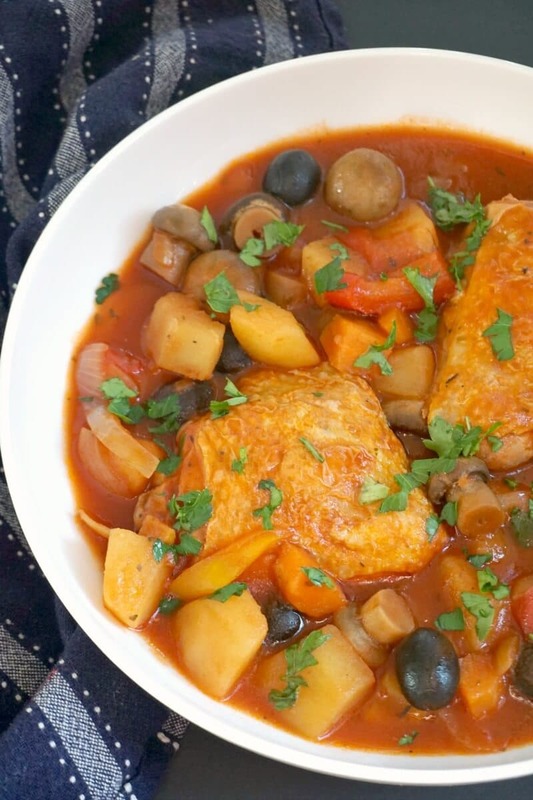 Healthy Slow Cooker Chicken Cacciatore, a fabulous chicken thigh stew with lots of nutritious vegetables. Packed with amazing flavours, and so comforting, this chicken cacciatore is a great family dinner no matter the season. Heat up the oil in a frying pan, then gently fry the chicken thighs until lightly brown. Add the thighs in the slow cooker, then peel and chop the onion, garlic, potatoes and carrots, and add the to the slow cooker too. If you use small mushrooms, you can add them whole, otherwise you can quarter or half them. Roughly cut the peppers, and add them as well. Add the chicken stock, tomato passata and herbs, and cook on high for 4 hours, low for 7-8 hours until the vegetables are tender. You can now add the olives, or you can choose to add them at any time during the cooking. Season with salt and pepper to taste, and garnish with fresh parsley.